Lithium coin batteries are used in a wide variety of applications, including personal watches, clocks, electronic organizers, PDA's, portable electronics, keyless door entry remotes, cell phones, computer motherboards, heart monitors, backup power sources for IC memories, and more. Lithium 3V provide 2x the nominal voltage compared to other chemistry makeup of batteries such as Silver Oxide and Alkaline button cells. High grade Toshiba brand, Japanese quality and performance. Lithium Manganese-Dioxide Coin Cell Battery, 3.0 Nominal Voltage. High Capacity 165mAh, Diameter 20mm, Height 2.5mm. Ten year shelf life. 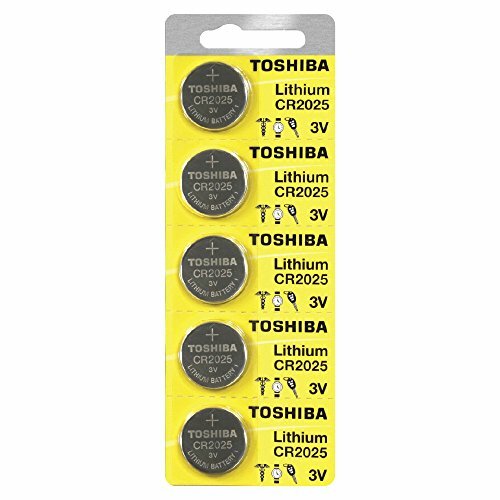 Original Toshiba branded consumer packaging tear-strip 5 batteries per card. Perfect for watches, fitness, Key FOB's or healthcare devices, and other electronic devices.